"Rounds complete, good effects on target, end of mission." The 333rd Field Artillery Regiment was activated in August 1917 as part of the 161st Field Artillery Brigade, 86th Infantry Division. The Regiment served in France during World War One, though it saw no action. After returning to the United States in 1919, it was released from active duty and assigned to the Organized Reserves. In 1942, the 333rd FA Regiment was recalled to active duty for World War Two, but in mid-1943 the Army reorganized all field artillery regiments into independent battalions. The 333rd FA, then stationed at Camp Gruber, Oklahoma, was reconfigured as follows: Regimental Headquarters became Headquarters & Headquarters Battery, 333rd FA Group (Mtz) (Cld), the 1st Battalion became the 333rd FA Battalion (155mm How) (Truck-D) (Cld), and the 2nd Battalion became the 969th FA Battalion (155mm How) (Truck-D) (Cld). These designations indicated that the new units were composed of black troops and equipped with the 155mm M1 howitzer, truck drawn. In the segregated US Army of World War Two, black Americans served in separate units under white officers—though by 1944 between one-third and one-half of the officers in Colored units were also black. Both battalions were attached back to the 333rd FA Group. The 333rd FA Group arrived in England in February 1944, where its attached battalions were reequipped with tracked prime movers (designations changed from Truck-D to Track-D). At the same time two more battalions, the 578th FA and the 741st FA, both equipped with towed 8-inch howitzers, were attached. The Group was allotted to the VIII Corps Artillery. In July 1944 it landed in the Normandy bridgehead and immediately entered combat. During the advance from Normandy to the German frontier, the 333rd FA Group's outstanding performance earned it a reputation as one of the best field artillery units in the European Theater. In December 1944 the German Army launched its Ardennes counteroffensive. In the opening stage of the Battle of the Bulge, the 333rd FA Group was overrun and partly broken up. The survivors attached themselves to the still-intact 969th FA Battalion, which withdrew into the Belgian town of Bastogne and took up firing positions in support of the 101st Airborne Division, which had been ordered to defend this vital road hub "at all costs." 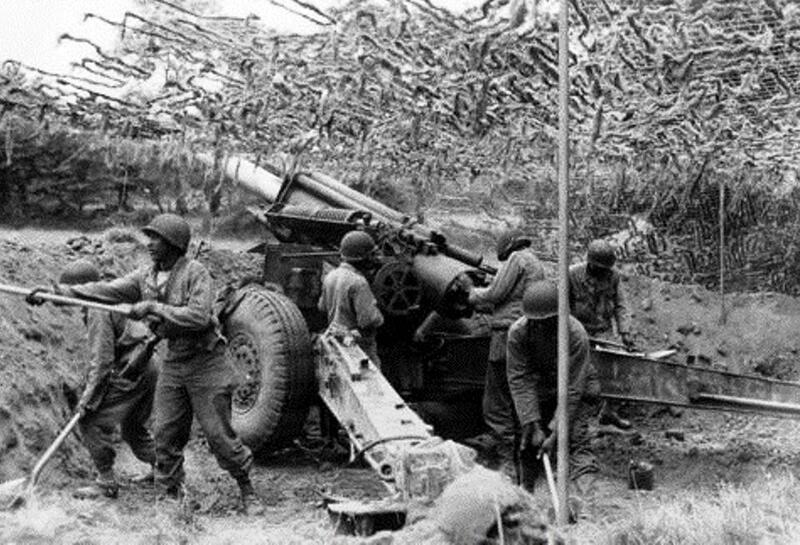 Only two field artillery battalions in Bastogne were equipped with the hard-hitting 155mm howitzer: the 755th FA and the 969th FA. Their guns became the lynchpin of the American defense, providing effective fire support to the defenders who, despite four-to-one odds, beat off every German attack until relieved by units of General George S. Patton's Third Army. By then, the 969th FA had only three operational howitzers left and was almost out of ammunition. For this action, the battalion received the US Presidential Unit Citation and the Belgian Croix d'Guerre with Palm. The regimental coat of arms and motto ("Three Rounds") commemorate the 969th's gallant stand at Bastogne. In an atrocity that long remained unknown to the general public, eleven soldiers of the 333rd FA Battalion were murdered by German troops during the Battle of the Bulge. These men had been captured when their unit was overrun but later managed to escape. While trying to regain the US line, they were recaptured near the Belgian village of Wereth by a German patrol of the 1st SS Panzer Division. There and then the SS troops brutally killed their prisoners, bludgeoning and bayoneting the unarmed men to death. Only in 1994 was the terrible fate of the Wereth Eleven widely publicized and in 2013 a congressional resolution recognized their sacrifice. The 333rd FA Group and its attached battalions were inactivated in 1946, but both battalions were later reactivated and served postwar. In the late 1950s, when the Army decided to restore regimental identities in the Artillery branch, the firing batteries of the 969th FA became Batteries D, E, and F of the 333rd Artillery Regiment (redesignated as the 333rd Field Artillery Regiment in 1972 when Field Artillery and Air Defense Artillery were made separate Army branches). In 1971, Battery D was redesignated as 4th Battalion, 333rd FA, withdrawn from the Regular Army, assigned to the Army Reserve, and headquartered in South Bend, Indiana. The 4-333 FA thus perpetuated the lineage and honors of the 969th FA Battalion. The 4-333 FA's peacetime higher headquarters was the 428th FA Brigade, also located in South Bend. Its CAPSTONE (mobilization) higher headquarters was the 212th FA Brigade, located at Fort Sill, Oklahoma. Soldiers of the 4-333 FA wore the shoulder sleeve insignia of the 428th FA Brigade. After many years of faithful service, the "Fourth of the Triple Three" was inactivated at South Bend, Indiana, on 14 August 1993. Today, two separate target acquisition batteries (TAB) in the Regular Army are the sole active representatives of the 333rd Field Artillery Regiment. Normandy, July 1944: Soldiers of the 333rd Field Artillery Battalion prepare their 155mm M1 howitzer to conduct fire missions in support of US VIII Corps.